Understand GST tax invoice, as an accountant the first thing under GST you will have to do is to create an invoice for outward supplies made. You will have good time before filing returns. Try free billing software by knowyourgst. But, you have to start issuing bill to customers under GST regime as soon as GST registration is obtained. It is very important for you to understand the structure of a GST tax invoice and comply with all rules specified. Tax invoice is the first and most important document you will have to deal in your profession. As per statics and various data collected, it is estimated that every month around 3 to 3.5 billion invoices will be issued under GST regime. You can understand the importance of this document from its volume. Whether you are a consultant or working as an accountant, having in depth knowledge of GST tax invoice will give you an edge over others. At knowyourgst I have created the application to issue invoices online. You can use this application to generate bills for free. This application can be used using internet, you can generate bills for free. Under GST 2 major documents are mentioned. I will advice you to use these terms properly. Earlier people referred an invoice as bill and vice versa. However to avoid any confusion I advice you to strictly follow these terms. A tax invoice is a document in which tax is charged on supplies and a bill of supply is a document in which tax is not charged. For example, if a person paying tax under composition scheme cannot issue a tax invoice because under composition levy it is not allowed to charge tax, he has to issue a bill of supply. At knowyourgst, the application can be used to make tax invoices and bill of supply. Read this full article to learn how you can harness the benefits of this invoicing application. You can read, how to use invoicing application to generate bill of supply. What is a Tax invoice under GST? A tax invoice is a document to be issued under GST to charge tax on outward supplies, in certain case such as purchasing from an unregistered person tax invoice is to be generated even if its an inward supply. A tax invoice should contain details such as name, address, GSTIN, state code etc. of buyer along with details of product supplied, HSN code, Quantity, Rate, Discount and tax charged. Whether software is required to issue a bill or invoice or manual tax invoice can be issued? You can issue manual tax invoices and having an invoicing software is not at all compulsory. Tax invoice is document containing details of tax charged and it can be either software generated or manual hand written invoice. But issuing bills manually can double your work under GST. For example, you need to upload details of all invoices issued during a month on GST portal. It will be double task to first issue bills and then punch them into an excel file or accounting software to generate a valid file to upload data on GST portal. I advice to use a software and use manual system of invoicing as a last option. What are the details to be mentioned in a Tax invoice? A tax invoice should contain the following details. You can download GST invoice format in excel to understand requirements of a tax invoice. Invoice can be signed using digital signature certificate (DSC)? Yes, a tax invoice has to be signed by taxable person or by his authorised person. Tax invoice can be signed using a digital signature. You need to have a valid DSC to sign a tax invoice. If you already have DSC to sign your returns on GST portal, you can use it to sign your invoices also. How does invoicing application work? KnowyourGst billing software is designed by me with a goal that generating tax invoices should not be a complex and time consuming task. You can generate an invoice within 30 seconds. This invoicing application can be used by anyone with a tablet or a computer. You can access it even with a mobile but due to screen size it may be difficult to correctly punch details to generate an invoice. To use invoicing application, you need to first register on Knowyourgst.com with your email id and password. You can also login with social networks such a Gmail/Google+, Facebook or Twitter. Once registered on website, you can start using this application. Your data is safe and utmost care is taken to insure that only you with your valid login id and password can access your data. First go to Invoicing application dashboard. Click on Add/Edit Company. Below form will open. Fill this form with details of you company. Once form is filled, click on save button. You detail will be saved. 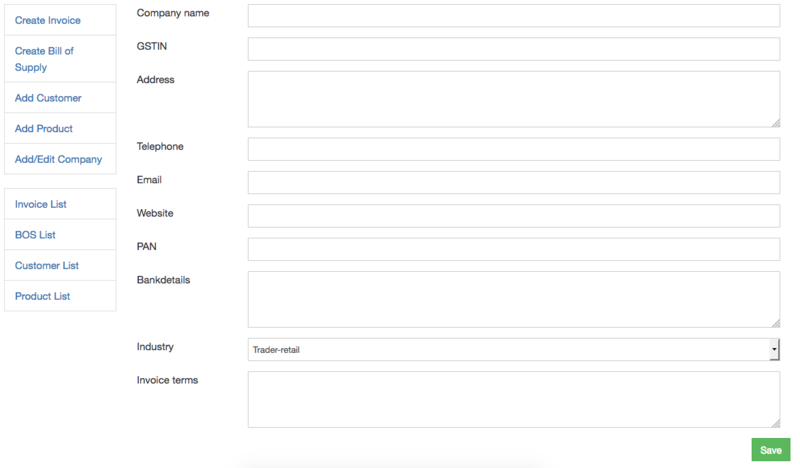 You can come on this form anytime to update details of your company. To add customer, click on Add Customer link. Fill the form. I recommend filling complete form. You can use these details in future to contact your customers or to send them marketing updates. Once form is filled, click on Save button. In same form you will have link for bulk uploading of customers details. If you are using any other accounting software, you can export your customers details in an excel file. Copy that data to excel format provided and upload. To add products, click on Add Product link. A form for product creation will open. You need to provide same HSN code provided in your registered certificate. You can also search HSN code on this website itself. To create a tax invoice, click on Create Invoice link. A new page will open. You need to fill this page to create a tax invoice. 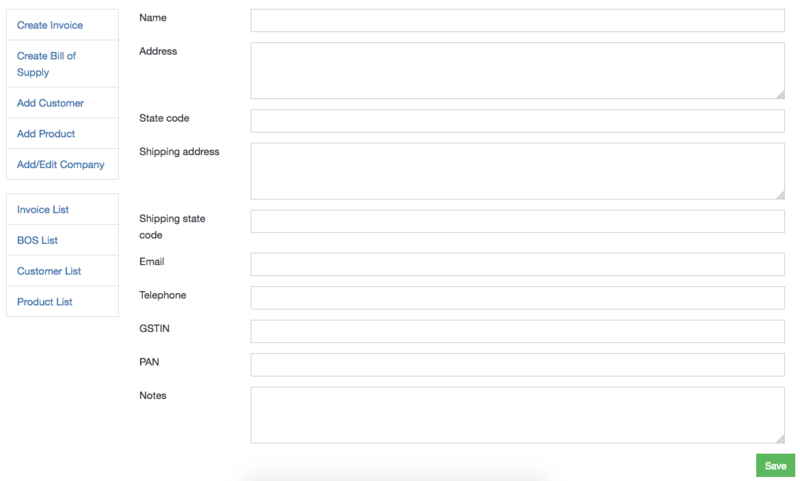 I have designed the invoicing form to give you a feeling of filling actual invoice. You need to first select the customer, you can start typing in the box and customers list will pop up. Select customer. Billing address will be auto filled from customer master data. Shipping address will also be auto filled, however you can change shipping details if it is different from shipping address provided at the time of creating customer record. You can choose whether it is an interstate supply. In case of inter-state supply IGST will be charged. Discount will be automatically calculated based on discount rate provided at the time of creating product record. However if you wish to calculate discount manually, you need to select Manual Discount check box. After filling above details, come to product part. Select the product, start typing the name of product. Once product is selected, other details will be automatically filled if provided at the time of creating product record. You need to provide only Quantity of supply. Now click on Create Invoice, you invoice is created!!! How to take print or edit an invoice and check list of invoices generated? Click on Invoice List link, to check the list of all invoices. Above image is preview of invoice listing table. You can download the list of invoices in excel or PDF and also you can print the full list. You can also search invoices for a particular client. You can sort or filter the data. The best part and biggest advantage you will have is community support. At any time if you face any issue in using this application or have any suggestion for improvements. You can use the Question and Answer facility of this website. Simply frame your question or suggestion as a valid question and ask it with tag KYG-INVOICING. Experts using this application will help you out. I will personally answer your each question. how to download Best GST invoicing software for free? did Doc toPDF download. Next? You can download excel file by clicking on the link given above. If you want to use our billing software then click on invoicing. 2)Amount rounded off to the nearest decimal. Do not want the total to show paise. If you can provide these then Great. Anyhow an alternative adjustment will be to add a product "Rounding off" with tax rates 0% and without HSN and use it as to round off paises.